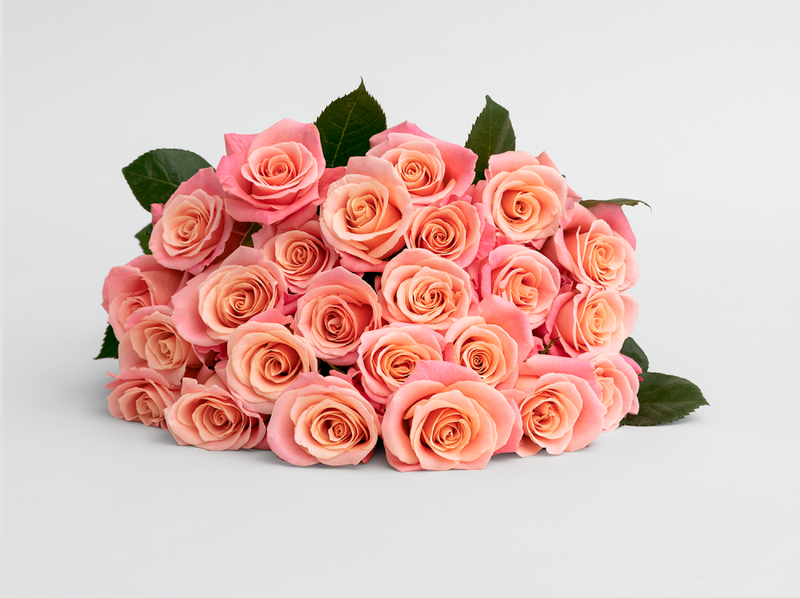 With Valentine's Day just around the corner, we decided to put some of the top flower delivery merchants to the test to see just what gets delivered after you place that order online. 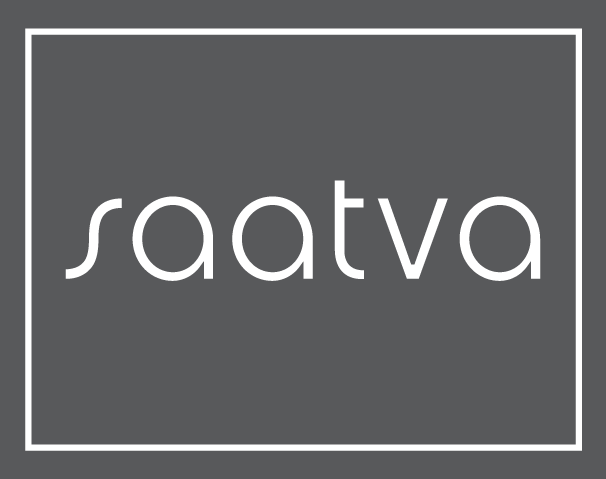 We've covered everything including the order process, shipping costs, delivery, and of course, the actual flowers, so you know exactly what to expect when you entrust one of these merchants to deliver your token of love to that special someone this year. We've picked an industry leader, 1-800-Flowers, a customer satisfaction award winner, JustFlowers.com, a field-to-door delivery company, ProFlowers, and a flower delivery veteran, TeleFlora. Read on to see how they stack up! All four companies had wide ranging selections of flowers to choose from. Since I was doing this for Valentine's day, I opted for a classic: one dozen roses. Red roses seemed a bit cliché, so I went with a colorful assorted bouquet, and tried to order as close to that as I could at each merchant. TeleFlora stood out as being easy to navigate and narrow down by flower type and price (my romance is on a budget, okay?). JustFlowers.com, on the other hand, had almost too many choices. I narrowed my selection to Valentine's Day > Roses > One Dozen, and I still had over 200 bouquets to choose from. It seemed a bit overwhelming, and several of the bouquets had different names, but the pictures looked identical. I like a smooth, simple checkout process that's straightforward and secure. Again, Teleflora has this step mastered to make it easy for the customer. As soon as I added my bouquet to the cart, it showed me the subtotal and the handling fee, so I knew how much I was about to fork over before I even got to the checkout page. It also gave me the option to add balloons, chocolate or a stuffed animal if I really wanted to up my romance game. 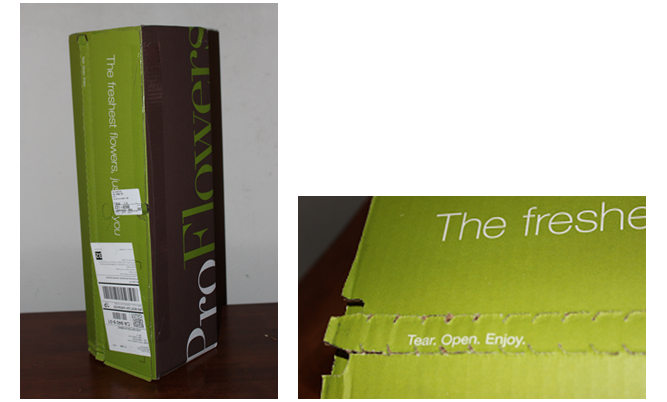 1-800-Flowers and ProFlowers also had intuitive shopping carts and checkouts, but they don't show you the handling/delivery fees until closer to the end of the process. JustFlowers.com didn't really have a shopping cart. Once I clicked on a bouquet to get more details, the only option was to go right to checkout. Also, they had an automated chat popup during checkout that was more annoying than it was helpful. *It's worth noting that Valentine's Day is on a Saturday this year, so many florists will charge extra for weekend delivery. 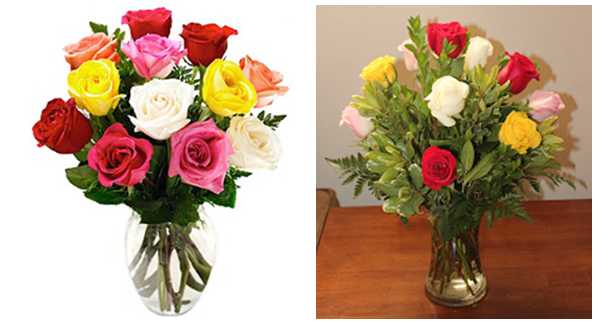 Expect to pay the additional amounts below if you want your flowers delivered on Feb. 14th. This is it. The moment we've all been waiting for. The flowers have arrived! All of the sites had options for some type of express delivery that would guarantee the flowers arrived earlier in the day, but I opted to just take my chances and see what happened. I was pleasantly surprised when a friendly delivery guy showed up around noon with arrangements of flowers from 1-800 Flowers and JustFlowers.com. 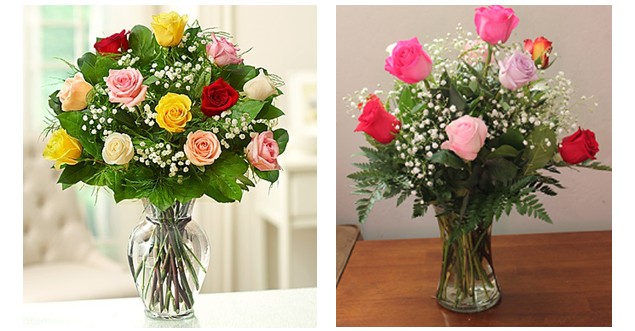 I guess they outsource to the same local florist in my area, so these two looked pretty similar, as you can imagine. Then, around 2:00pm, a woman arrived with a lovely bouquet in a square vase (identical to the one pictured on the website) from Teleflora. So far we're three for three. A few hours later, around 6:30pm, there was a shuffling sound outside my front door, a thud, then silence. I waited a minute and then went to check, and sure enough, a box had been delivered. 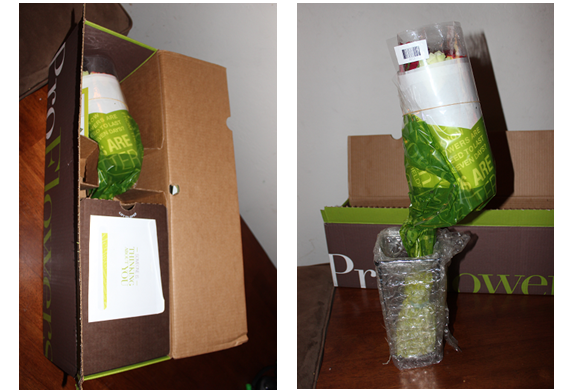 There was no knock, no friendly delivery face, just a big, green, rectangular ProFlowers box on my doorstep. It definitely was not as romantic of an arrival as the first three. Here are pictures of the photos on the respective websites of the arrangements I ordered versus what was actually delivered. The websites all have disclaimers somewhere around their checkout pages noting that they may have to substitute flowers or vases based on availability, so I wasn't expecting exact replicas, but I wanted to see how close to the mark they came. I also noticed that somehow in the professional shots, they get all dozen flowers to face the same way. Try as I might, I was not able to replicate this from any angle with the bouquets that were delivered. It's kind of like what McDonald's commercials look like versus what you actually pull out of the greasy paper bag at the drive-thru. At least your recipient probably won't see the professional pictures, so they won't know any different. "Tear. Open. Enjoy." Well, it probably wouldn't have read as nicely if they had included all of the steps between "Open" and "Enjoy." This is what it would look like if I followed the three-word instructions on the delivery box. Not a bad look...kind of modern art deco, perhaps, but it probably doesn't convey the sentiment you were hoping to send. After a little fancy scissor work and quick glance at the instructions (I mean, they're just flowers, right? ), we were in business! 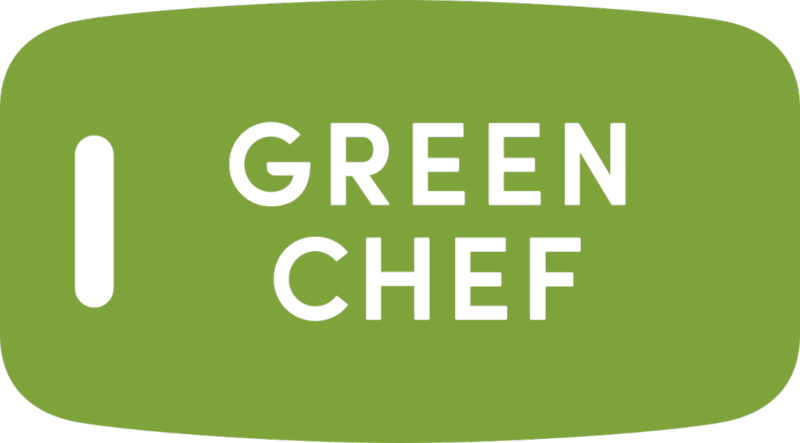 Overall, these are all reliable companies and solid choices for delivering flowers, whether you're ordering something for Valentine's Day, Mother's Day, a birthday, or just to make someone's day. Each company seemed to have strengths in different areas of the shopping and delivery process, so the final choice really depends on what factor is the most important to you out of price, ease of shopping, and delivery experience. 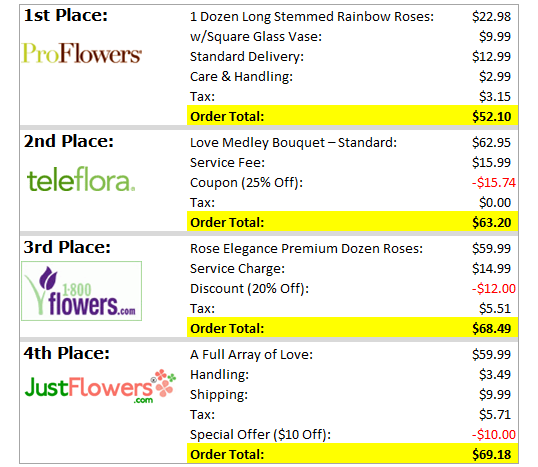 Hopefully now you have a better idea as to which company is the best fit for your flower delivery needs! 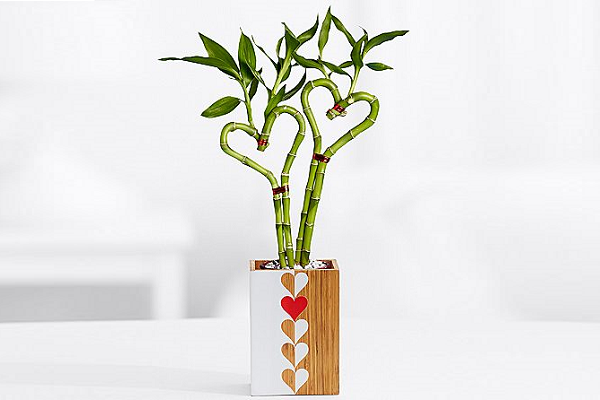 The 2016 Valentine’s Day Gift Guide for Every Personality …We All Know Someone Who’d Like #3!